When you are a little child, most of your free time should be spent screen-free. It's perfectly alright to learn ICT in school and to use the computer at home to do school work. It is okay to watch a couple of television shows over the weekend. It is not acceptable to spend every free minute, all school holidays cooped up indoors with a screen staring back at your face. We love doing things as a family so we can all get away from our screens and enjoy being with each other. Whether it is a holiday away from it all or a ramble in the countryside, I am all for stepping outdoors for an adventure. It may not always be possible to get out of the house though. That should not be a limiting factor on the fun we have as a family. Jigsaws, books, crafts and board games are fantastic boredom busters and great for family bonding. J was a bit under the weather this weekend, so we were confined to the house. It was the perfect opportunity to try out this new board game from University Games. 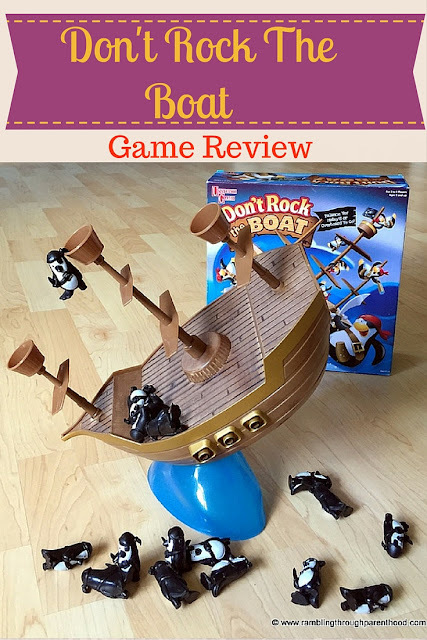 Don't Rock The Boat is all about balance, precision and finding the centre of gravity of a rocking boat. The box comes with a plastic pirate ship and 3 detachable masts. The two blue pieces, a base and a pivot, assemble easily to make the rocking wave. And there are 16 pirate penguins, each with an eye patch and peg leg. The idea is to balance the boat on the rocking wave and take turns placing the penguins on the boat without toppling it over. Easier said than done, especially when you are only five years old and get very excited around pirates and penguins. J, M and I spend most of Saturday afternoon trying to balance the pirate penguins on the very unsteady rocking boat. The best we could manage was about four, before we decided to hang them over the edge with their bandanas. That seemed to do the trick for a while at least. We got a few more penguins on board before rocking the boat. After a good few rounds playing the game as per the intended instructions, my son decided to get creative with it. He abandoned the rocking wave and used the pirate ship and it's penguin crew in imaginative play instead. All good, I say. The plastic boat looks less than sturdy, but I suppose it needs to be thin and light to balance and rock easily on the pivot. The pirate penguins are just fantastic. As mentioned previously, they can serve a dual purpose for added fun. Don't Rock The Boat is a fun game for all the family to enjoy. It retails for around £14.99 and is suitable for 5+. As with all games, it teaches little ones to be patient and take turns. The rocking boat is a good way to introduce concepts of balance and centre of gravity to young minds. And the penguins can be used to reinforce numbers and maths operations. Disclosure: We were sent the game for the purpose of this review. All opinions are my own. This post contains affiliate links. This game looks loads of fun. I think its important to have screen free time every day. I agree instead of being cooped up inside stuck to our screens its nice to breakaway from it and enjoy family time. I am loving the look of this game. OOH I think Syd would love this - adding it to my Amazon list for his fifth birthday in a couple of months!